In the 1800s, diplomats and merchants from around the world arrived in the port of London and would buy meticulously crafted maps which also served as gifts, ornaments, and elegant tokens of remembrance. This hand-drawn map took over three years to produce and accurately describes the capital city of London in 2012 during the reign of Queen Elizabeth II. Designed in England, this old style map accents the romance, wonder, and history found in maps used by explorers, early diplomats and merchants in the 1800s. Our maps are inspired by legendary explorers and cartographers such as Joan Blaeu, Captain James Cook, Joseph Cross, Edward Weller, and Ralph Agas. 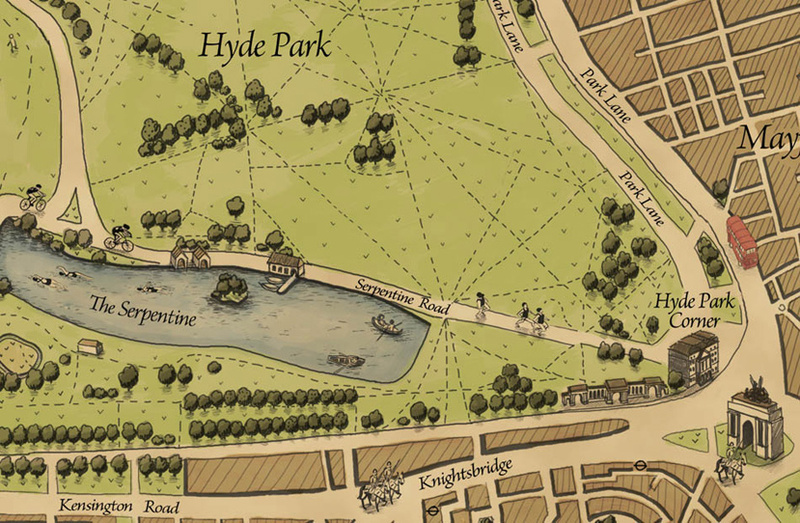 "10 of the best hand-drawn maps." “Well your map has caused us endless trouble. It was intended to be a gift for an American friend. However my husband claimed it. Then my son decided it would look great on his study wall." Allow up to one and a half weeks for free shipping. Contact us for priority post rates. This map is good for framing but does not come framed. Canvas maps are not stretched and will be shipped in a tube. Allow up to 3 days for printing and a week for free shipping. Contact us for priority post rates. This map is good for framing but does not come framed. Canvas maps are not stretched and will be shipped in a tube. Free shipping on these maps includes international orders! Overseas shipping worth up to £45. 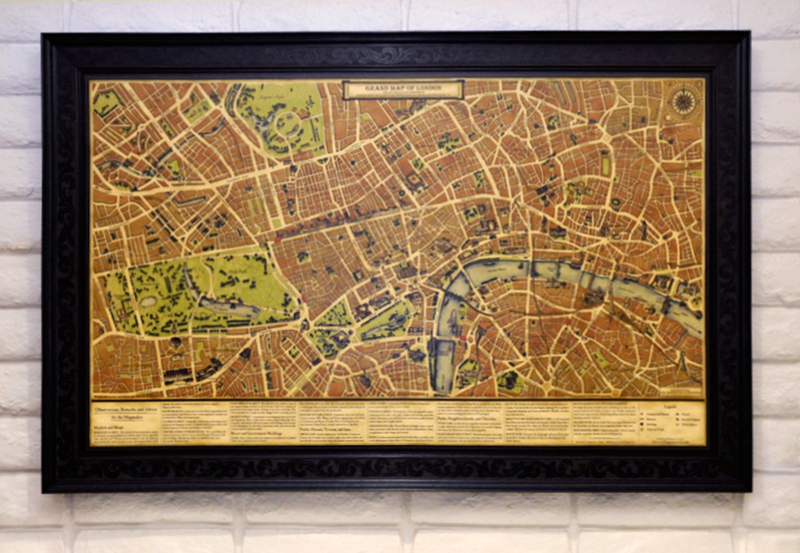 This beautiful vintage 1800s style wall map took over three years to produce and accurately describes the capital city of London in 2012 during the reign of Queen Elizabeth II showing major streets, markets, churches, great houses, neighbourhoods and public buildings. Hand-drawn in England, this rare map is one of the few contemporary maps still made in the historical style, incorporating symbolic and traditional elements of maps used by travellers and explorers of past centuries. 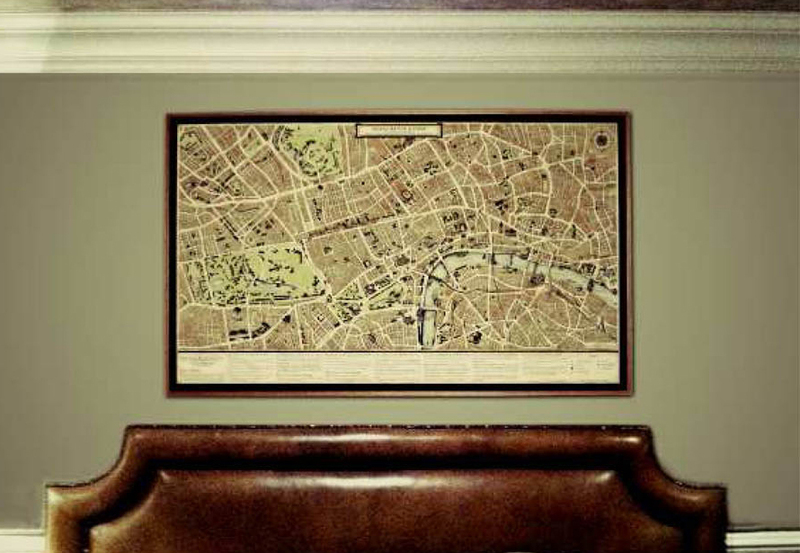 Extending from Kensington Palace Gardens to Tower of London, this map measures 170 x 100 cm and makes a strong statement in any home or office. Learn about the artwork and see the map in high resolution. Like the folded canvas maps of the 1800s, our map also contains a guide for travellers about local markets, churches, neighbourhoods, and lodgings. In addition to being Olympic themed, it accurately accounts for newly developed motorised and horse-drawn carriage roads and buildings such as the Shard. Our maps are made to enchant anyone who loves history and appreciates art. Some of our top customers include City of London, bookshops, galleries and hotels. In the 1800s, diplomats and merchants from around the world arrived in the ports of London and would purchase maps from pedlars. Maps were not only very popular but also a crucial tool that kept visitors safe and informed of markets, churches, neighbourhoods, and lodgings. These meticulously crafted working documents also served as gifts, ornaments, and elegant tokens of remembrance for early travellers. 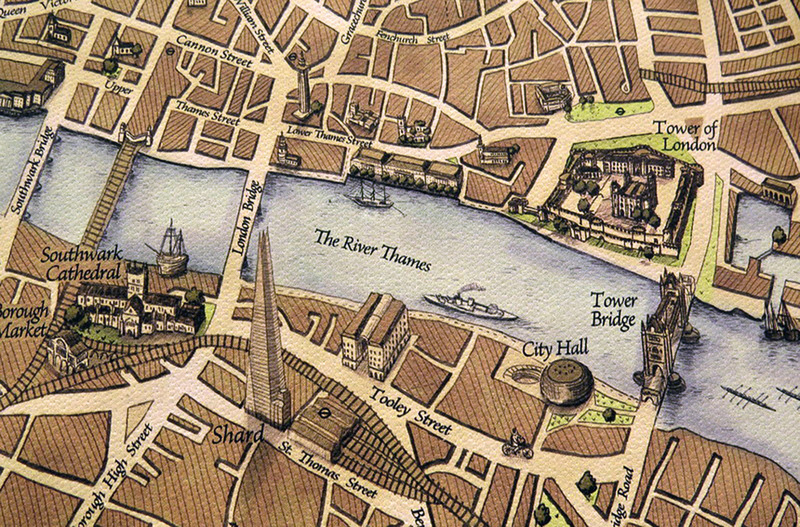 As the city changed, so has the look of its maps – but not ours. Our current day maps have kept the same style true to the originals used in the days of Arthur Wellesley, 1st Duke of Wellington. Interested in maps, art, and travel? Sign up or visit our Wellingtons Travel Map Blog! We quality inspect each and every one of our maps before sending them but if you find any faults in any of our maps please email us. We will happily give you a refund or exchange. We've worked with city agencies, event planners, designers, and interior decorators. If you'd like to work with us, let us know.